A hypothetical SimCity expansion just might turn the game into everything fans wanted it to be. SimCity players may have opened their inbox this morning to see a survey from EA, asking for input about a theoretical expansion to the game. 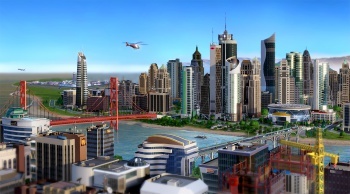 While no such expansion has formally been announced, the survey seems to indicate that EA is interested in giving gamers all the features that SimCity was bashed for not including. To wit, the potential new features include an offline Classic mode, much bigger cities, cooperative multiplayer city building, a God Mode with wide-scale terraforming, and many more possible additions to the game. Of the features mentioned, quite a few seem to be direct responses to the heavy criticism SimCity received at launch. Classic Mode would let you "play a single fully functioning city using cheats and unlocks" either on or offline. One survey question mentions doubling the maximum city size, while another proposes "Cities without Boundaries" which might remove limits altogether, opening up "miles and miles" of city space. Some of the more fleshed out features sound like they're already in the works, including a few with a distinctly cyberpunk vibe to them: "Simulate to the Sky" would add SuperScrapers with vertical zoning and multiple levels of transportation, creating dense cities under steel skies. You can check out the survey in full right here to see all the options on the table. There were a lot of problems with SimCity, but if even a fraction of these updates are implemented, it could "fix" the game for many disappointed fans.